According to Modern Bride Magazine, over 50% of your guests will remember HOW they were entertained more than any other wedding decision you will make! There are no do-overs, so invest in the best for yourself. Encore Events is comprised of wedding industry entertainment experts that have one thing in mind: to CREATE AN UNFORGETTABLE EXPERIENCE FOR YOU & YOUR GUESTS. WHAT WE DO - We don't do "gigs," cheesy games, have one-size-fits-all packages to choose from, or perform outdated standards. Our client experience was developed to redefine wedding entertainment planning. We will relieve your stress, solve problems, save you time, and help guide you to your dream wedding. THE ENCORE EXPERIENCE - Our Owner & Founder, Rich Cranston, autographs each event with his masterfully creative & detailed expertise. From your first meeting in our "Dream Space" showroom. WHY US? - Founded in 1998, Encore is a full-time, high-end event entertainment company that has performed in front of more than 1 million guests since our start. Our staff is hand-picked to deliver prompt, knowledgeable and creative guidance. You will have the opportunity to select your headliner or enhancement (photo booth, lighting) before signing any contracts. "Rick Parisi was phenomenal! He has a great personality, easy to work with and also made us feel at ease. We see why he’s the best dj in Rochester! Rick knew exactly what we wanted and kept the party going all night. Thank you for an amazing evening :) Shayla & Brian"
"Encore Events is AMAZING!!! We got married in Jamaica and Rich traveled to Jamaica and made sure all my music needs where taken care of. He has a true passion for what he does and took so much stress off of us on our wedding day. I can not Thank Rich and the staff of Encore for all their help!" "YOU MUST BOOK ENCORE EVENTS! Truly--Encore took care of us from start to finish. It is so overwhelming to plan and execute all of the "entertainment" details, but Encore makes it completely manageable and fun. They can literally do anything you want --such as designing a winter wonderland snowflake ceiling light show, making all of your entrance music at the reception perfect, and helping you execute a secret flash mob for your new spouse:) John Roach was our DJ and he is truly the agent of awesome. Brittany, his trusty sidekick, literally was there at every turn to hold or hand a bouquet, take some candid pictures and even hand me double-sided tape at an opportune moment! Encore also took care of our Videography and we cannot wait to see it! I highly recommend Encore--it is worth every penny for the peace of mind you will have during the planning and for the amazing product. They will take your wedding reception from good to GREAT and beyond! " "I don't even know where to start with my review!!! Encore is absolutely amazing! John was our DJ and our dance floor was PACKED the entire night! He really is a master at reading the crowd and playing the perfect music to keep people dancing. From the time the dance floor opened until the end of the reception (which we extended 1.5 hours because we were having the time of our lives), there was not a second that people weren't dancing. John worked with our families to make a few surprises happen- our nephew sang What a Wonderful World and my dad played Tears in Heaven on his flugelhorn with a background accompaniment. We have had so many people reach out to tell us that we had the best wedding they'd ever attended, to which we give full credit to Encore! I wish we could get married again just to have another amazing party with Encore! " "John worked with us from the very first meeting and was the DJ for our wedding. I had been to other weddings where it seems as if the DJ ends up being the center of attention or was so bad no one was on the dance floor. This was not the case with John and Encore. From the first song everyone was on the dance floor and he played a wonderful balance of genres to please all of the guests at the wedding. I think the biggest asset was the wedding website that Encore provides. 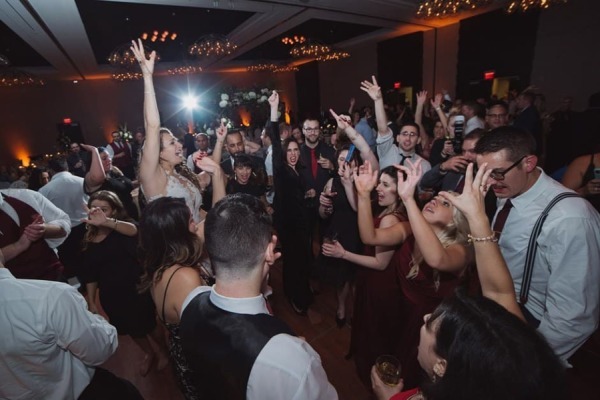 It allows you to have a time line of events so as the bride and groom you can enjoy the evening and not have to keep telling the DJ to announce this or play that. It also allowed my husband and I to pre-select (or pre-block) any songs that were essential for our evening." "John was one of our favorite vendors to work with while preparing for our wedding. He was flexible, professional, and responded to any questions or last minute requests immediately at any time of the day. The day of the event went flawless because of his talent to keep the event organized, the guests engaged in the music, and the dancing nonstop until 2 am! We provided John with our favorite songs and the songs "not to play".... but really we didn't need to. John is in the know of what people like and took requests all night long. He played every single request we had, as well as from our guests without missing a beat. One of the best things about John is his confidence and versatility he is able to offer to tailor exactly what you want while giving you a realistic approach due to his experience. I cannot say enough positive things about Encore, they truly were amazing and treated us like we were family. Would highly recommend to anyone on any budget. " "Encore exceeded our expectations! From the first meeting we were impressed with the attentiveness and quality of service we received. We were treated like family, and felt comfortable telling John exactly what we liked and did not like about weddings we had been to. The dj can make or break the wedding which is why we chose the best there is! Our wedding was amazing and encore helped us not only with the music but with lighting, decorations and ensuring proper and effective communication between all our other vendors. I would recommend encore for anyone who is planning a wedding or party, they are beyond amazing! Thank you encore and John, we love you!" "Shaun and John were both great to work with. Planning was easy. The personal website they give to organize/plan music was so helpful. During our wedding reception, John helped keep us organized. He checked in with us several times to make sure we were happy- and we were! We also got photo booth and lighting through Encore. Photo booth was worth every penny! Everyone loved it! Lighting was very nicely done."